Here’s a great January activity if you see an opportunity to purchase some 75% off Christmas balls: make a Christmas ball wreath. My motivation in December was that I had occasion to go through my grandmother’s Christmas tree decorations, and I discovered some Christmas balls from the 1940’s and 1950’s. I knew by the box styles and the paint patterns that I was looking at Christmas memories and treasures–probably not worth a lot, but beautiful. I decided to combine the ones that were not damaged into a Christmas ball wreath to display on a mirror, like the elegant ones I often see in home decorating magazines. I watched a great tutorial that walked me through the basic steps. Side note: What I love about this woman’s tutorial is the absolute ordinariness of the toys, couch and general house mess behind her. 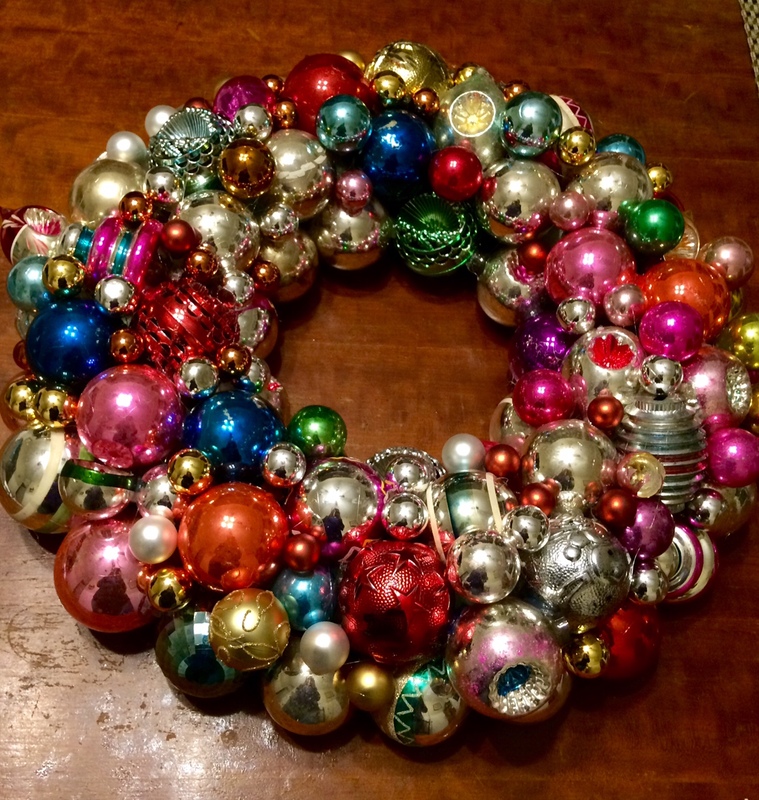 The tutorial is easy to follow: materials needed include a styrofoam wreath shape, about 50 balls in assorted sizes (mostly big, some medium and a handful of little ones to fill in the gaps), colors and shapes, and hot glue. You will need between 60 and 90 minutes to do it right–that’s not too much time, but don’t hurry. One problem with using antiques instead of the recommended dollar store assortment, is that the older ornaments are much more fragile. I followed the directions and removed the wire tops. 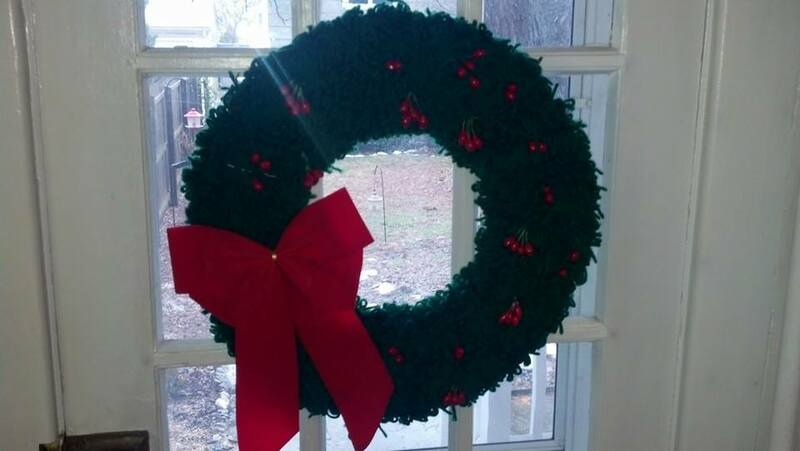 Working from the inside circle toward the outside rim, I created a rather large wreath. It became larger and larger as I tackled all of the gaps in between the bigger balls. When I was finished (and my fingers were sufficiently burned from careless application of hot glue), I was delighted with the result. I held it up to the wall to imagine its lovely future, and when I set it back down, three or four of the old balls spontaneously combusted. What a mess. I like old balls (insert joke here), but the modern ones are just as nice and less problematic. I modified my plan, and the large wreath is now on my dining room table with a pillar candle in the middle. It’s really too large for the table, but beautiful just the same. Total cost to me for the first wreath: $5 styrofoam wreath and $1 worth of hot glue sticks. While I was surfing for a video of a Christmas ball wreath that justified my use of a wire frame (without success), I came across a video that instructs the crafter how to make a wreath from pages of an old book. Last year, Jeremy set himself up to make a wreath a month: The Yule Log 365 Wreath-of-the-Month Club (I made that up just now, but it’s catchy.) He’s been talking about some very creative ideas for this year, 2015. I accept the challenge, and I’m going to shoot for making one a month–on second thought, maybe we can split the task. He can do even months, and I’ll do odd. 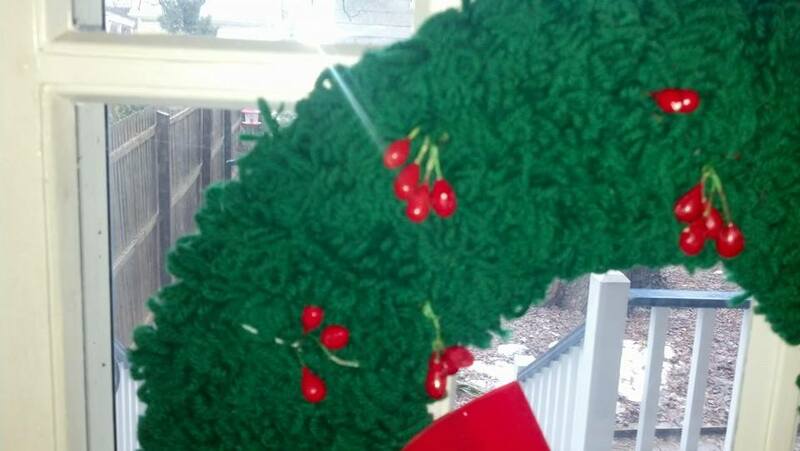 My focus, though, is going to be on wreaths I can make without going overboard on the expense of the materials. I’ll be posting my results and the cost of each. The Yule Log 365 hopes that you are able to save some of your Christmas spirit to carry through the year by launching a similar project or series of projects. Let us know your plans for 2015. Wreath a month? That’s a go! Prior to Christmas I attempted to make a small version of the wreath to give as a gift for Secret Santa at work. It went pretty well but it took WAY more hours to do that I predicted. The supplies and directions are simple. Flat wreath frame- I used styrofoam- light-weight and affordable. Cut a piece of yarn about 12 inches long. Use this to determine the size yarn you will need. Wrap it around the frame and tie it into a small bow. Cut off the excess yarn. THis is the length yarn you will need. Cut about 100-200 pieces this length to start. Take each piece of yarn and tie it into a small bow on the frame. Yarn should be close together, nearly overlapping. The bows should be tied at different spots on the front face of the frame to give it a full bushy appearance. Continue cutting yarn and tying bows until the entire frame is covered. Add your decorative bow when finished. You may want to add other beads or decorative items. I intend to make a full size wreath this month. It will go to the Festival of Trees in November as a donation. This is the first of my wreath plan for 2014. I happened upon a post on the Buzzfeed website titled “50 Wreaths You Can Make Out of Anything”. Of course I had to read more. There are lots of great ideas in there. Some are pretty elaborate and time-consuming (#s13, 18, 37, and 50). Some are quite simple and quick (#s 4, 16, 33, and 36). Others are pretty weird or just not my thing (#s8, 14, 41, and 44). But then there are those that are just right! My first four to make are #s 2/3, 9, 32, and 43. That will get me to June. On our next podcast Natalie and I will be discussing some of the wreaths. Maybe we can each do one a month? That would give us 24 wreaths created by the Yule Log. Sounds like the start of a great plan! My mom responded to my call for Christmas cards, and tonight, she presented me with a box of them that most likely represents her entire mailing list from the past five years. Armed with fresh cards, I’m ready to construct. 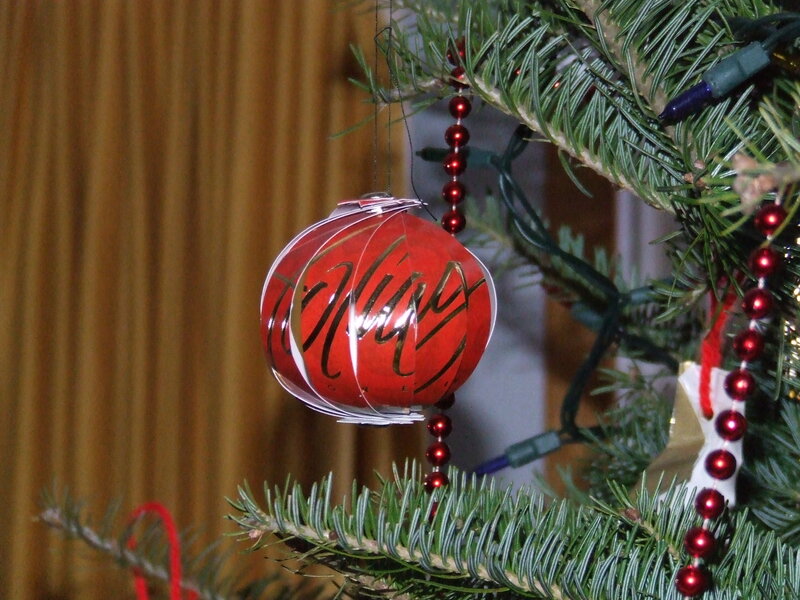 I tried a paper ball ornament that I found on a blog, “More Time Moms Musings.” The ball is made out of strips of Christmas cards fastened together with a paper fastener at each end. I was skeptical about the simplicity of it until I unfurled the fan of strips. Voila! I had a beautiful little ornament. What I like most is that the strips make the same picture that was on the card, except now it is in the round. The photo here is from the blog site I found, but my ornament was equally pretty, with a blue-green forest of Christmas trees. I demonstrated my craft to a co-worker, and when I fanned out the strips, I felt like a magician. She was appropriately impressed. After this post, I’m going to get down to business making a dozen or so. Woodworkers Nativity Sheet– This site gives a basic overview and a short list of links. If you want to make an heirloom set from wood this is a nice starting point. 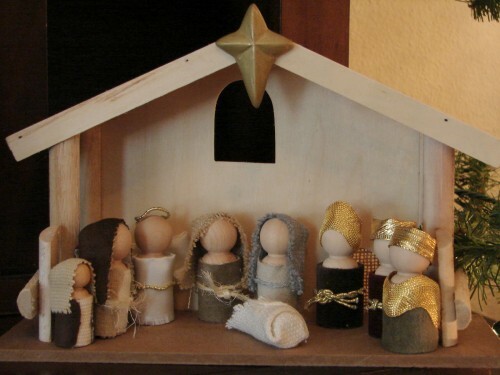 Crafty Nativity Set– This blog details a crafty based display a man created for his daughter. This one looks like lots of fun to make and would be a great gift for Christmas lovers of all ages. 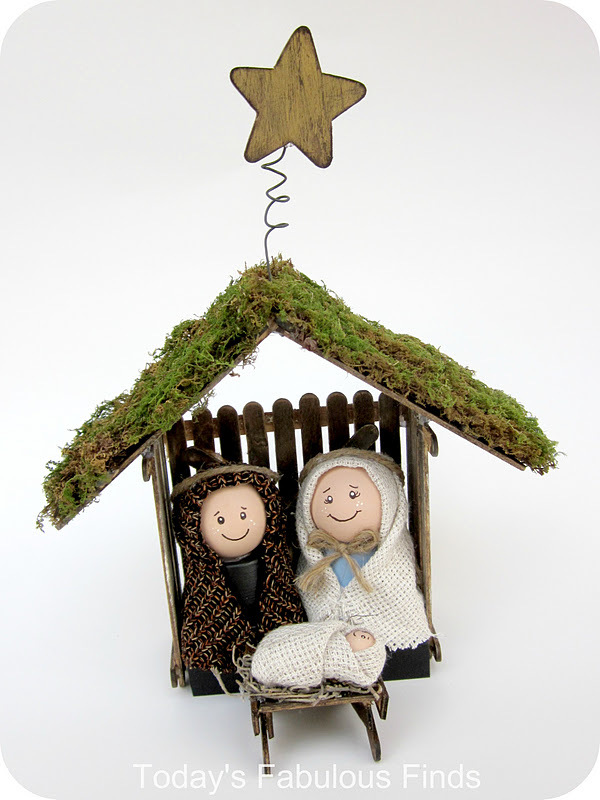 Build a Children’s Nativity Set– Another crafty creation. This is a great idea to make with the children in your family. It is very simple and can be modified to take on different looks. Keeping it simple is a good idea when working with the kids. I think this might be the one that I make with my nephew this fall! The nativity build is my new quest! I hope to have one attempt complete by the end of summer. If you have any experience with this activity, please let me know. I’ll need all the guidance and advice I can muster.